It makes use of forest debris that is usually just abandoned in the field. This type of cultivation has been practised successfully at an industrial level for decades in Asia, in both sheltered conditions and semi-sheltered conditions. The technology to ensure the success of such crops in the undergrowth isn’t yet fully developed; procedures and methods require further experimentation before being proposed on a large scale. Moulds and wild mushrooms grow in the culture instead of the intended strain of mushroom. These are problems for which solutions must be found over the course of several growing seasons under real woodland conditions. Fungi that grow on the wood of coniferous trees (Ganodermas, Pholiota Namekos, Angel Wings, Phoenix Oysters) do not grow on the wood of deciduous trees (Pleurotus, Grifolas, Hydnums, Shiitakes, Turkey-tail Mushrooms, Golden Pholiotas and several species of Oyster Mushrooms) and vice versa; species of fungi must therefore match the species of trees that are available. Furthermore, the mycelia do not fructify until the culture medium provided for them is fully invaded and sufficient reserves have been accumulated. When the mycelia are fully developed and favourable weather conditions exist, abundant fructification is obtained. The choice of culture site is of great importance and must meet the following requirements: be easily accessed, shaded and sheltered from the wind, with the possibility of watering. It is easier to transport crushed forest waste than to attempt growing and harvesting at a site that is difficult to access. A culture bed is established for several years and renewed after each fructification. In addition, maintenance and monitoring of crops require frequent visits. Inoculation is best accomplished using a liquid mycelial culture, but it can also be done with a culture in grain or sawdust or with pre-inoculated plugs. Stumps are inoculated on their surfaces, and logs are inoculated at both ends and via holes drilled around and along the log. This allows for rapid invasion, leading to abundant fructification of the mycelium after a brief period. 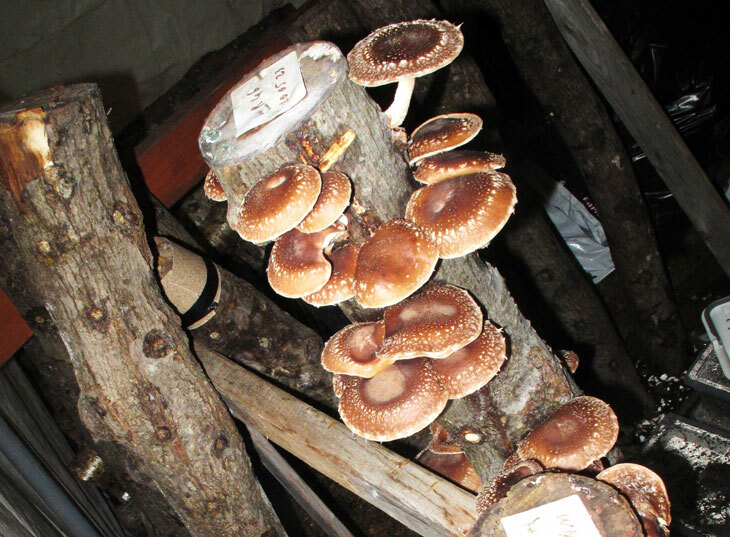 In this photo, a Shiitake log inoculated as previously described produces an abundant fructification in a car shelter after two growing seasons. In this case, slugs presented a significant challenge and wax filling the holes and injured areas didn’t work. 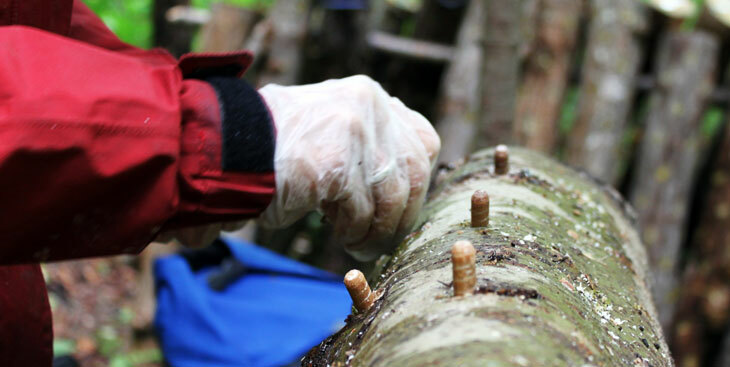 Nevertheless, cultivation on logs or stumps usually prevents the mycelium from being eaten by insect larvae and the culture medium from being invaded by mould and undesired fungi. Blewits grow mainly in the litter of deciduous trees but also in the litter of coniferous trees. By lifting dead leaves or needles that have accumulated on the ground, one can observe the mycelium spreading in shiros near the surface. During fructification, it is easy to identify the Blewit’s mycelium, in which case samples can be collected to start new colonies. The distance between the various colonies should be 10 to 15 metres. If implanted at a single point, the mycelium will take a few years to expand and produce a circle of fruit bodies; for faster performance, it’s helpful to create an implanted circle 1 to 1 ½ m in diameter, inoculated at different points or around the entire circumference. However, inoculum from the same shiro should be used to allow the mycelium to merge. The implantation of a new colony takes place when the leaves are beginning to fall. Blewits generally develop after the first autumn cold. Their blue colour isn’t always obvious; it’s often more like grey or white, with a slight bluish hue. Other characteristics can be used to accurately identify them, as described in the database of the Filière mycologique de la Mauricie. A fairy circle of the same size as the one shown here will develop fruit bodies over a period of two to three weeks in single file and always in the same direction. Harvesting should take place twice a week to ensure that only quality Blewits are picked. More information for the Blewit. Parasol Mushrooms grow in the litter of coniferous or deciduous trees or in piles of organic matter, but they develop in troops. Single point implantation can create a troop, but to accelerate the process, create multiple inoculation points approximately 30 centimetres apart, using implants from the same troop or strain so that they can merge. Unlike Blewits, Parasol Mushrooms grow from May to October, so output should be monitored diligently during the warmer seasons and until the first snowfall. More information for the Parasol Mushroom. Shaggy Parasol troops can be implanted in the same way as Parasol Mushroom troops but in soils containing animal waste, such as old cattle pastures, ancient dunghills, derelict farmyards, etc. Fructification usually occurs in the second half of the season. More information for the Shaggy Parasol. Morels grow in troops in the company of deciduous trees. With the exception of Fire Morels, they’re never found with coniferous trees. Black Morels often grow beneath poplars and fruit bushes, such as the pin cherry, but they can be found in a wide variety of habitats in well-drained soil. Yellow Morels may grow at the edge of the forest, but they may also grow in the undergrowth. Troops are implanted using the same method as that suggested for the Blewit. In addition, when planting poplar or hardwood trees, the root systems of the seedlings can be soaked in a liquid inoculum of Black or Yellow Morel to establish new colonies.